Scissors Applique Alphabet is a great applique for those back to school shirts! Featuring a marvelously quick stitch out embroiderer's will love! Includes letters A thru Z. Font shown (the name Bailey) is Rainbow Clouds Embroidery Font and is available as a separate purchase. 4x4: 3.87 x 3.87 inches. SC: avg: 6016. 5x7: 5.00 x 5.00 inches. SC: avg. 7951. 6x10: 6.00 x 6.00 inches. SC: avg. 9687. 8x8: 7.482 x 7.82 inches. SC: avg. 13,094. 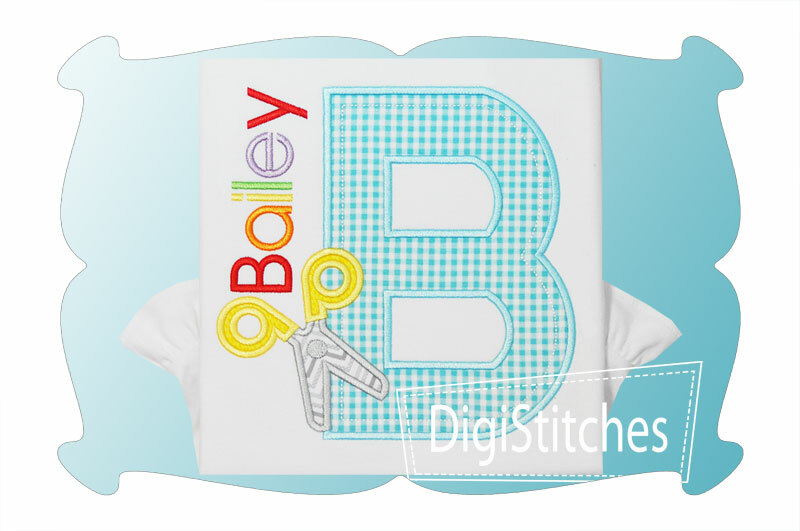 Scissors Applique Alphabet is a great applique for those back to school shirts! Featuring a marvelously quick stitch out embroiderer's will love! Includes letters A thru Z.
Font shown (the name Bailey) is Rainbow Clouds Embroidery Font and is available as a separate purchase. Scissors Applique Alphabet comes in 4 sizes. All sizes included with your purchase!